The shooting rampages and bias incidents in schools are not disconnected. They are all part of a giant, manipulative, recruitment effort spreading so quickly that most people are woefully unaware of crucial details. This resource connects the dots so we can better articulate the danger. 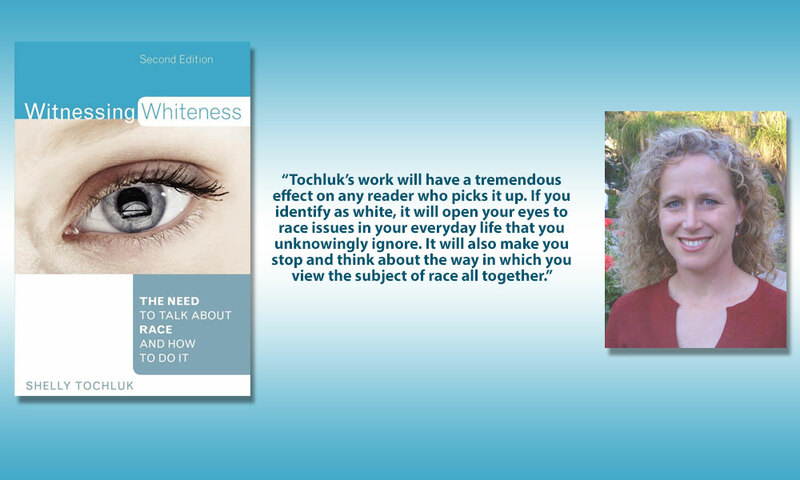 A recorded webinar on how to transform your guilty feelings into effective anti-racist action, recognize destructive patterns, and develop a healthier anti-racist white self. Produced and made available by Everyday Feminism. Available for on demand viewing. Newly released! This series provides free agendas and handouts for community groups to deepen their anti-racism practice. Move through the series chapter-by-chapter or by thematic thread, depending upon your needs. Check it out! Take a listen while I share about what I’ve learned about race, racial identity, and the need to show up for racial justice. 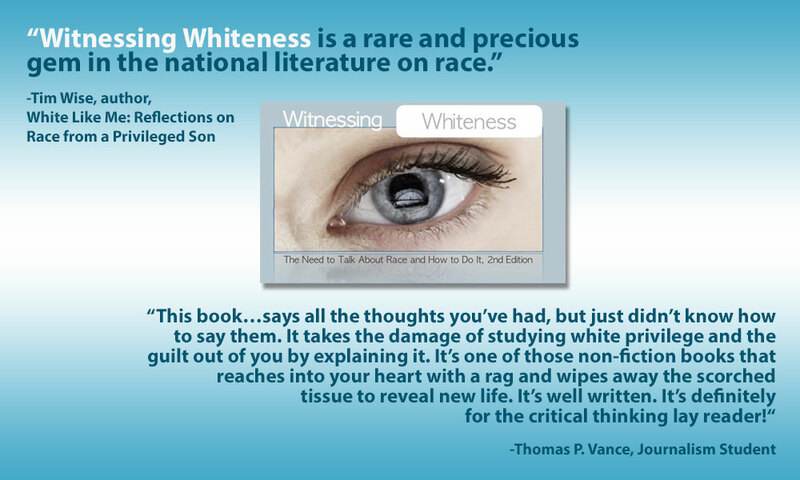 Visit the Witnessing Whiteness Workshop Series webpage to access a full set of curriculum resources you can use with your community as you read Witnessing Whiteness together. Workshop agendas with facilitation guidance and handouts are available for free download. 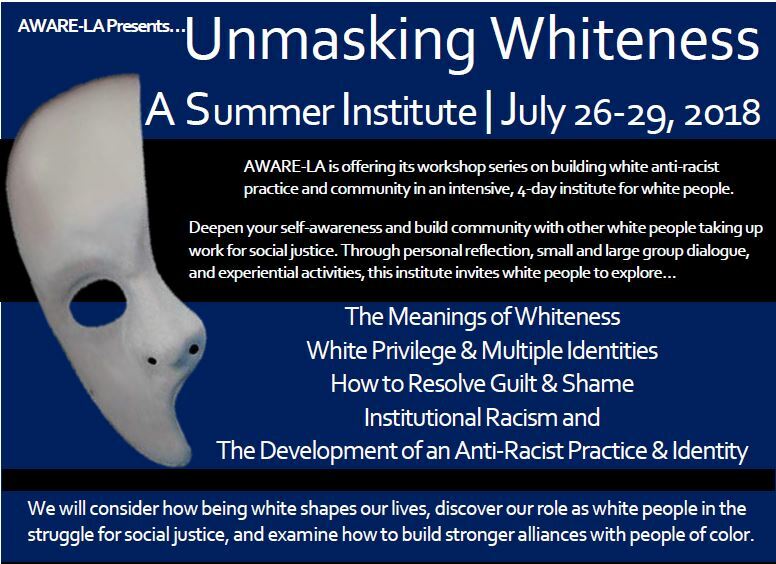 Every summer I help co-produce and co-facilitate a 4-day institute called Unmasking Whiteness with AWARE-LA. 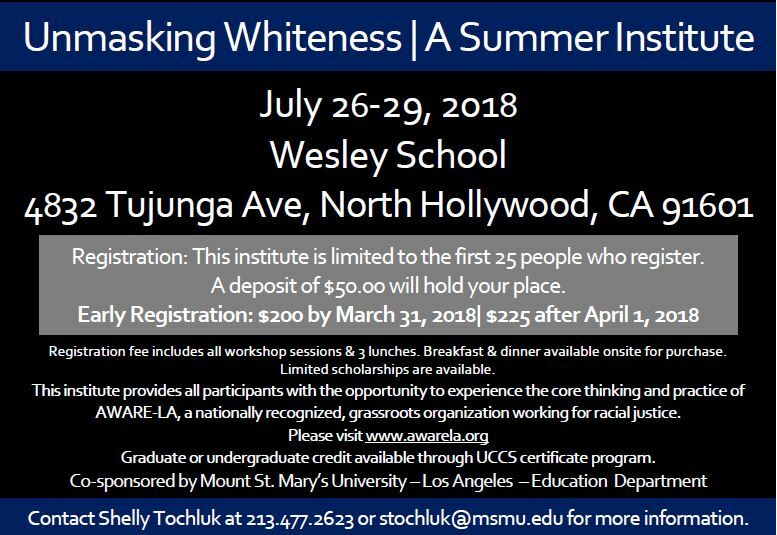 It is designed for white people who want to dig deep and investigate white identity, privilege, and how to develop their anti-racist toolkit. Join us! Registration opens each December and spots tend to fill very quickly. Learn more here. A guiding vision… My deepest hope is that this information can inspire people to join me on a journey of self-discovery. No one growing up in our nation can escape the racist messages that are part of our country’s foundation and current cultural milieu. It will take all of us working together for a very long time to dismantle the systems of white supremacy that support current structures of inequity. To do this we need to understand how we fit into this system and how it affects our daily lives.